BBQ Mango SauceCapture some of that exotic summer flavour with this mango mop. Marinate for 30 minutes, but be sure to leave leftovers to add for extra flavour after grilling. It’s always nice to bring something a little unusual in to give your favourite BBQ food a real flavour boost. The right sauce can make all the difference in the world – especially when it comes to quick and easy BBQ recipes that could do with a kick. 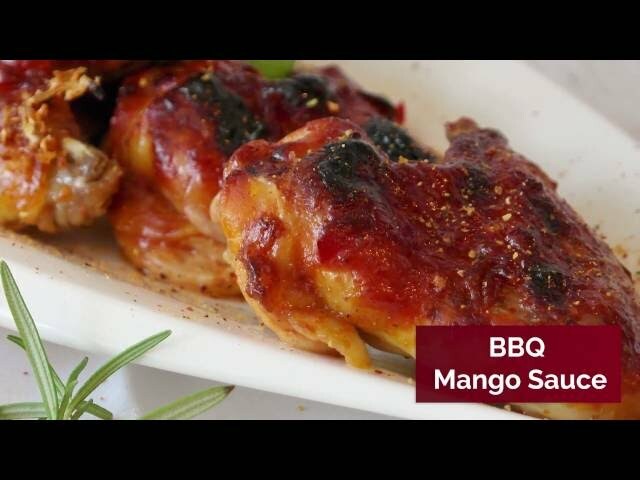 This gorgeous Mango BBQ Sauce ticks all the right boxes! Add a touch of sublime sweetness to your favourite pork BBQ recipes and classic grill staples, either as a glaze during cooking or a dip to finish things off. Just be sure to make plenty – the speed this stuff gets devoured at is simply mind-blowing! Place all the ingredients in a pan and mix thoroughly. Bring to the boil over a medium heat, then simmer gently on low for around 10 to 15 minutes. Stir frequently and remove from the heat when the sauce begins to thicken. Use as a marinade 30 minutes before grilling, glaze meats and fish while cooking or use as a fantastic sauce for burgers, meats and vegetable.